BMH-600HV is one the most demanding plant and its gained reputation for producing products of unparallel quality. Height with Cylinder 500 mm +Width 1600 mm Length with Pallet Feeding Rack 4150. Make Italy, RPM/minute – 4500 Pressure: 150kgcm2,cc-140/minute ,extra attachment Bearing Housing “V” Pulley to belt drive. Length:2285 mmx700 mmx600 mm rolled out by chain fitted with 1 H.P Motor and Gear Box. High Pressure & Low Pressure Double Twin Pump “DENISON” Make. Pressure Handling Capacity 280 Bars. Container with Quality C.R/Sheet Machine Foaled Powder Coated Fully PLC Control, Worlds No.1 Schneider Make Manual/Semi/Fully Auto Mode with Production Memory and Fault Alarm. Dash Board Control switch buttons are Fully Dust Proof, Touch screen. Size Width-600 mm Single line Length-28 Feet. Heavy Section Channels. Triple Roller for Mix Conveyor and Single Roller for Belt Guiding. All Rollers are with Double Side Sealed and protected with Dust Seals. 3 HP Motor Coupled with 1:25 Bonfiglioli Gear Box 3 Ply Rubber. Agitator is using for loosening the mix in Feeder Box to ensure smooth mould filling. Eccentrically twin shaft movement. Drive by 3hp motor and Bonfiglioli Gear Box. 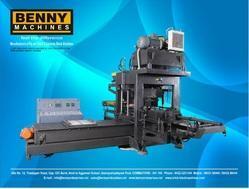 Looking for Hydraulic Paver Block Machine ?